Twitter strikes again - Jenner costs SnapChat millions! Following the recent redesign of SnapChat's user interface, many users have been taking to Twitter to complain. One user in particular, though, had a significant impact on the stock that listed last year. Kylie Jenner, half-sister of Kim Kardashian and a US reality TV star in her own right, has 24.5m followers on Twitter, so when she Tweeted that she wouldn't be using SnapChat any more it had a significant impact on the company's stock - wiping $1.3bn off its value according to this report by the BBC. Although if you look at the chart below, the stock was clearly on a downward trend anyway. But it shows that Twitter really can move markets. 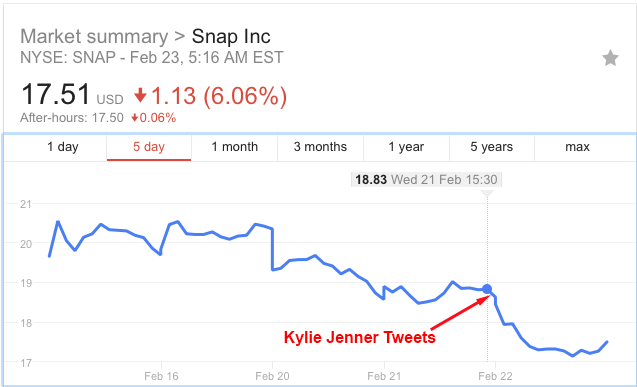 We wonder how many traders actually managed to short the SnapChat stock on seeing Ms Jenner's Tweet, and how many fund managers who'd invested in SnapChat sold on the news. We may never know, but that was a clear trading opportunity. If your firm doesn't give you access to Twitter, or if it does, but Kylie Jenner isn't on the whitelist of accounts you can follow, then maybe you should have a look at EarlyBird? Note: the time on the Tweet is GMT, and the time on the chart is EST.